LuckyPet, Inc. - Ordering instructions:1click buttons for your choice of color and size!2Click CUSTOMIZE NOW to add your personalized engraving info. Up to 5 lines of engraving are available. Our beautiful enamel pet identification jewelry is stylish and the quickest way to guarantee your pet is returned home safely. Please note: tag colors can vary slightly from the pictures, depending on your monitor. 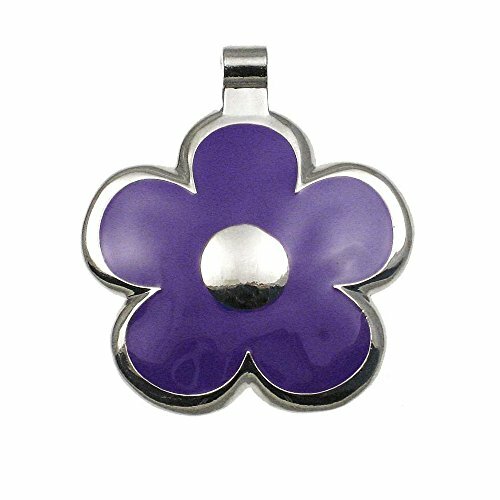 Beautiful enamel flower jewelry Tag - Deeply Engraved on Back Side - Split Ring Attachment Included. All engraving goes on the back side of the tag. Please note: your engraving info will automatically be defaulted to ALL CAPS unless you write a note specifying otherwise. To order: 1 click buttons to choose tag! 2 Click CUSTOMIZE NOW to provide your personalized engraving info! Flower Jewelry Tag - Easy to Read Engraving on Back Side - LuckyPet Pet ID Tag - Dog Tag & Cat Tag - Size: Large, Color: Purple - These metal flower shaped dog & cat ID tags are perfect for any pet! A pet id can be read by the rescuer so that they can call you right away. All details for ordering this tag are under Product Description below. 100% customer satisfaction; lifetime guarantEE, Fast shipping - ships 1 business day after you send us engraving info. More information about LuckyPet, Inc.
LuckyPet, Inc. - Fast shipping - ships 1 business day after you send us engraving info. Customized pet id tag with Easy-To-Read Laser Engraving. Colors available are blue, green, black, red, mint, purple, lime green, pink, yellow, light blue and white. Ordering instructions: 1 click buttons to choose tag size & color2 click customIZE NOW to add customization to your tag! Up to 5 lines of engraving are available!Please note that your engraving info will automatically be defaulted to ALL CAPS unless you write a note specifying otherwise. Our beautiful enamel pet identification jewelry is stylish and the quickest way to guarantee your pet is returned home safely. To order: 1 click buttons to choose tag! 2 Click "CUSTOMIZE NOW" to add engraving to your tag. See all details under product description below. Split ring attachment included. See all of our tags! - Click on LuckyPet under the title of this page. LuckyPet Pet ID Tag: Paw Print Jewelry Tag - Custom Engraved Cat Tags and Dog Tags -Size: large, Color blue - A pet id can be read by the rescuer so that they can call you right away. Our tags are so durable that we have a lifetime guarantee policy. Each id tag is custom engraved to your specifications and shipped out to you within 48 hours of order completion. Sizes available are small 1-inch diameter and large 1 & 3/16-inch diameter. Lifetime guarantee - 100% customer satisfaction. Divoti Inc. - Please choose the right sizes! Heavy duty forged for comfort curved surface with high polish: Divoti Pet Tag Quick Clips are designed with no unnessary hanging and dangling with curved surface. Fast shipping - ships 1 business day after you send us engraving info. Customized pet id tag with Easy-To-Read Laser Engraving. Split ring pack options make it easy to attach different pet ID tags to the quick clips / spring-loaded snap hook- standard size comes with 10 mm split rings / both medium and larg sizes have 15 mm split rings. Engraving will be in all caps! write us a note in the Gift Message if you don't want all caps. Virtually indestructible :surgical stainless steel has extreme hardness for wear resistance, high tensile strength for durability and austenitic for corrosion resistance against acidity and alkalinity. X1f44d;****new sizes just added*** 3 size opitons: spring gate snap hook clips come standard in 3 sizes with 3 opening limits please see the illustration on gallery. Divoti Dog Tag/Pet ID Tag w/Pet Tag Quick Clip Combos- 1 Pair 2 pcs of Standard Quick Clips - Entirely sugrical Stainless Steel - Overall, our pet tag clips provide the best comfort and smooth feel to your pets. Change pet tags quickly and securely with simple clip-on/-off. Complete solution options: standard size comes with 10 mm split rings / both medium and larg sizes have 15 mm split rings. X1f44d;optional: split ring option pack has 4 of 10-mm /15 mm and 15. 5 x 18 mm oval split rings. More information about Divoti Inc.
LuckyPet, Inc. - It's the most versitile in pet tag clips! It fits any collar size yet is compact so that it doesn't hang down too far. Overall, our pet tag clips provide the best comfort and smooth feel to your pets. Change pet tags quickly and securely with simple clip-on/-off. Complete solution options: standard size comes with 10 mm split rings / both medium and larg sizes have 15 mm split rings. X1f44d;optional: split ring option pack has 4 of 10-mm /15 mm and 15. 5 x 18 mm oval split rings. Compact, versatile quick clip - Set of 2! - Quickly Move Pet Tags Between Collars! Klippys come with A Split Ring Attachment pictured. Engraving will be in all caps! write us a note in the Gift Message if you don't want all caps. Perfect for Dogs and Cats - 2 Pet Tag Quick Clips - LuckyPet Klippy 2-pak! - Silver - Virtually indestructible :surgical stainless steel has extreme hardness for wear resistance, high tensile strength for durability and austenitic for corrosion resistance against acidity and alkalinity. X1f44d;****new sizes just added*** 3 size opitons: spring gate snap hook clips come standard in 3 sizes with 3 opening limits please see the illustration on gallery. Find other uses for it too: easy key ring transfer, quickly change children's ID's from jacket to jacket, etc. When you want to change collars, you just unclip the Klippy from your old collar and clip it to the new one. Sample tag and collar in picture are not included. LuckyPet, Inc. - See our pet tags! click "LuckyPet" under the title of this page. **. Klippys come with A Split Ring Attachment pictured. Split ring attachment included. See all of our tags! - Click on LuckyPet under the title of this page. Works on virtually every collar Size max 11/64-inch, the diameter of D-ring on most large collars. Our tags are so durable that we have a lifetime guarantee policy. Each id tag is custom engraved to your specifications and shipped out to you within 48 hours of order completion. Sizes available are small 1-inch diameter and large 1 & 3/16-inch diameter. Made by luckypet for your lucky pet. A pet id can be read by the rescuer so that they can call you right away. Custom Engraved Cat Tags and Dog Tags -Size: large, Color lime green - LuckyPet Pet ID Tag: Paw Print Jewelry Tag - Fast shipping - ships 1 business day after you send us engraving info. Customized pet id tag with Easy-To-Read Laser Engraving. Engraving will be in all caps! write us a note in the Gift Message if you don't want all caps. Split ring attachment included. See all of our tags! - Click on LuckyPet under the title of this page. Blueberry Pet - All pictures are taken with our production samples from a size of Medium; Please measure your pets carefully for making the right purchase. Fast shipping - ships 1 business day after you send us engraving info. Customized pet id tag with Easy-To-Read Laser Engraving. Please choose the right sizes! Split ring attachment included. See all of our tags! - Click on LuckyPet under the title of this page. Please do not attach any dog leash with this loop. Always look at the size chart for the recommended weight range to confirm the size. Perfect for Dogs and Cats both! Engraving will be in all caps! write us a note in the Gift Message if you don't want all caps. Blueberry Pet 6 Patterns Soft & Comfy Easter Spring Rose Print Plum Purple Padded Dog Collar, Medium, Neck 14.5"-20", Adjustable Collars for Dogs - Neck 14. 5"-20", ribbon on neoprene layer width 3/4", entire webbing width 1", size medium; the collar does not stretch itself, please make sure leave ONLY 2 fingers between collar and dog neck. To order: 1 click buttons to choose tag! 2 Click "CUSTOMIZE NOW" to add engraving to your tag. See all details under product description below. Another reason you should get this collar now is the super soft neoprene layer, which exhibits good stability and maintains water-resistant for this warm season. Overall, our pet tag clips provide the best comfort and smooth feel to your pets. Max and Neo Dog Gear - Features:6' long, 1" wide x 2mm thick nylon padded handle for comfort d-ring for easy clip on accessories Reflective stitching on both sides for nighttime visibility Gunmetal finished quality metal Lifetime warranty IT'S EASY TO HELP When you purchase a Max and Neo dog leash, we donate an identical dog leash to a dog rescue. Together we can support dog rescues with a never ending supply of leashes. In special cases, we tally up the number of leashes and collars sold. The second padded handle at the end for comfort against the wrist. Perfect for Dogs and Cats both! Engraving will be in all caps! write us a note in the Gift Message if you don't want all caps. Max and Neo Double Handle Traffic Dog Leash Reflective - We Donate a Leash to a Dog Rescue for Every Leash Sold Purple, 6 FT - When you receive and feel the leash you will know that it was made with care. Works on virtually every collar Size max 11/64-inch, the diameter of D-ring on most large collars. Overall, our pet tag clips provide the best comfort and smooth feel to your pets. Change pet tags quickly and securely with simple clip-on/-off. Blueberry Pet 1040269064 - Quality heavy duty metal clasp. We donate down our list of rescues until each one has received a donation and then we go back to the top of our list. The second padded handle at the end for comfort against the wrist. What are you waiting for? Prepare your pups to get into the spirit of our favorite season - the spring. Summer news - this spring loving daisy print is going to stay your loved companion's wardrobe and be your pups new favorite. Made by luckypet for your lucky pet. Small breeds like poodles, corgis, yorkshire terriers, shih Tzu, pugs, spaniels, chihuahuas, maltese, russell terriers etc. Medium breeds like french bulldogs, bull terriers, bulldogs, collies, Australian shepherds, dachshunds, beagles, boxers etc. Blueberry Pet 6 Patterns Soft & Comfy Easter Spring Loving Daisy Prints Padded Dog Collar, Medium, Neck 14.5"-20", Adjustable Collars for Dogs - Large breeds like labrador, rottweilers, german shepherd, labrador retrievers, huskies, golden retrievers, great danes etc. Heavy duty forged for comfort curved surface with high polish: Divoti Pet Tag Quick Clips are designed with no unnessary hanging and dangling with curved surface. One located 18 inches from the clasp. Think of going to a branch walking your pups with this beautifully designed dog collar on, you are sure to be the center of the park! Because this dog collar has the ultimate spring loving design not only the print but also the style. Engraving will be in all caps! write us a note in the Gift Message if you don't want all caps. CNATTAGS LLC - Polished Mirror-Finish Surface. It is 1" wide and made of 2mm thick but soft heavy duty nylon webbing designed to handle the largest dog breeds. Fast shipping - ships 1 business day after you send us engraving info. Customized pet id tag with Easy-To-Read Laser Engraving. Never leave your dog unattended with a collar on. To order: 1 click buttons to choose tag! 2 Click "CUSTOMIZE NOW" to add engraving to your tag. See all details under product description below. Made by luckypet for your lucky pet. Together we can support dog rescues with a never ending supply of leashes. Dog rescues: each month we donate to different rescues throughout the usa. CNATTAGS Stainless Steel with Enamel Round Pet ID Tags Various Designs and Colors - Based on the number, we will donate to rescues out of turn based on their immediate needs. Quality construction: our double handle traffic dog leash has all the features of top of the line dog leashes. Stainless Steel Split Ring Included. Fast shipping - ships 1 business day after you send us engraving info. Customized pet id tag with Easy-To-Read Laser Engraving. To order: 1 click buttons to choose tag! 2 Click "CUSTOMIZE NOW" to add engraving to your tag. See all details under product description below. Blueberry Pet - We consulted with many dog rescues to find out what they wanted in a perfect dog leash. Neck 12"-16", size small; the collar does not stretch itself. Quality heavy duty metal clasp. Reflective stitching to improve your visibility at night. Easy control - once you use a two handle leash you will wonder how you walked your dog without one. Klippys come with A Split Ring Attachment pictured. The loop tied to the logo is specifically designed for the purpose of attaching dog charms, tags, pendants or accessories. Heavy duty forged for comfort curved surface with high polish: Divoti Pet Tag Quick Clips are designed with no unnessary hanging and dangling with curved surface. Please do not attach any dog leash with this loop. All pictures are taken with our production samples from a size of Medium; Please measure your pets carefully for making the right purchase. Elegant and simple, just like the 3M Reflective Multi-colored Stripe collar, this martingale collar comes with combined practicality and reliability: comfy polyester materials and durable hardware. Blueberry Pet 8 Colors 3M Reflective Multi-Colored Stripe Safety Training Martingale Dog Collar, Violet and Celeste, Small, Heavy Duty Adjustable Collars for Dogs - Your purchase helps a dog rescue: for every leash sold, we donate an identical leash to a dog rescue. Its matching leash b01eswanbg /harness B06WLLPT2M sold separately. All pictures are taken with our production samples from a size of Medium; Please measure your pets carefully for making the right purchase. Fast shipping - ships 1 business day after you send us engraving info. LuckyPet, Inc. - Please do not attach any dog leash with this loop. The martingale collars provide more control over the dogs without the choking effect of a slip collar. Lifetime guarantee - 100% customer satisfaction. The loop tied to the logo is specifically designed for the purpose of attaching dog charms, tags, pendants or accessories. Overall, our pet tag clips provide the best comfort and smooth feel to your pets. Change pet tags quickly and securely with simple clip-on/-off. Complete solution options: standard size comes with 10 mm split rings / both medium and larg sizes have 15 mm split rings. X1f44d;optional: split ring option pack has 4 of 10-mm /15 mm and 15. Custom Engraved Cat Tags and Dog Tags -Size: large, Color red - LuckyPet Pet ID Tag: Paw Print Jewelry Tag - 5 x 18 mm oval split rings. Compact, versatile quick clip - Set of 2! - Quickly Move Pet Tags Between Collars! Made by luckypet for your lucky pet. One located 18 inches from the clasp. Great for when you need to keep your dog closer to you in traffic, obedience class, or around others. Quality heavy duty metal clasp. We donate down our list of rescues until each one has received a donation and then we go back to the top of our list. Please take the measurements at the head and neck showing in the size chart.